The Turkish word for breakfast is kahvaltı, which translates as under-coffee, or food eaten before drinking coffee. Therefore, a traditional Turkish breakfast starts with tea and ends with a cup of coffee. 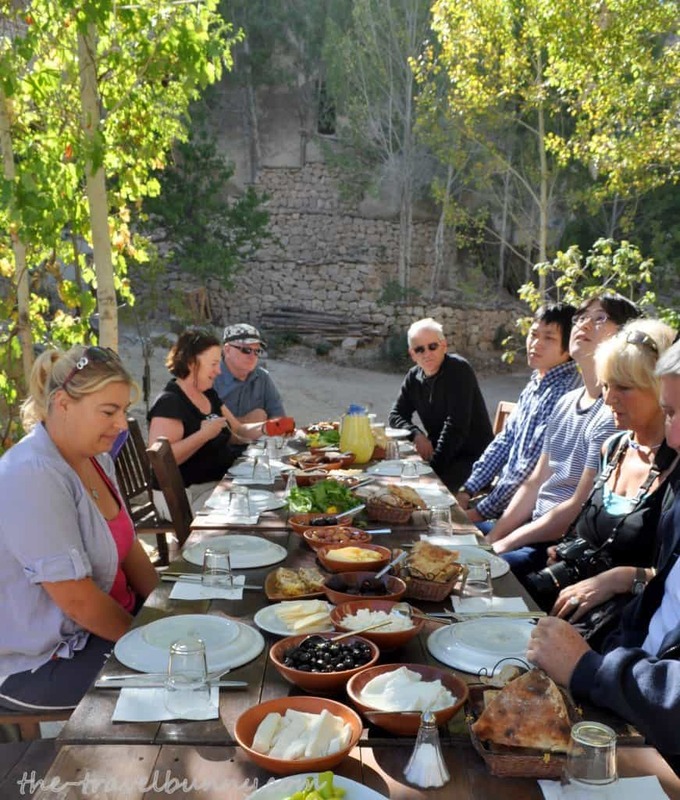 The feast between the two can include bread, butter, olives, salads, yoghurt, cold meats, fruit juice jams, honey and eggs. Hungry yet? 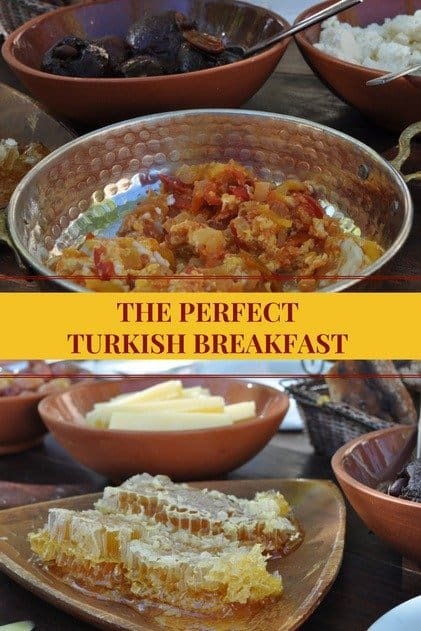 All the breakfasts we ate in Turkey were excellent but the one we had in King’s Valley was the best. Ever. 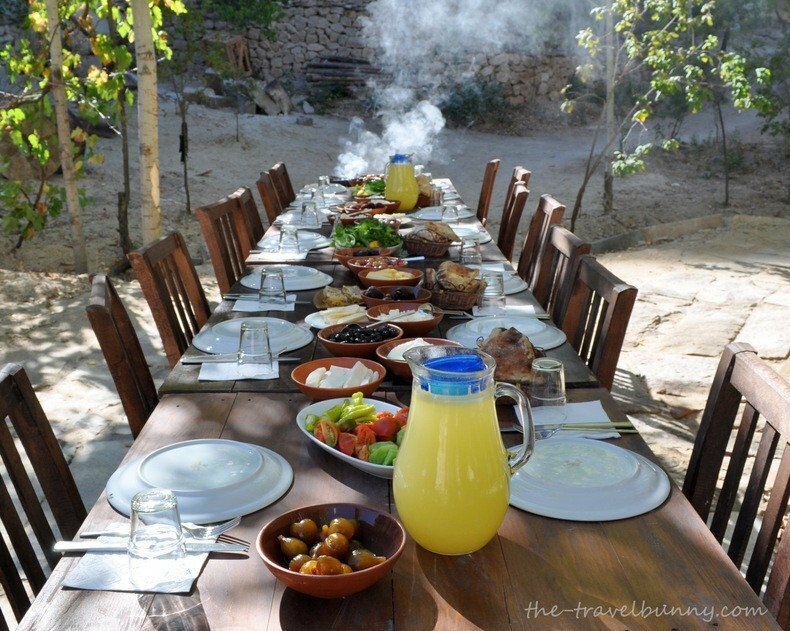 There’s something about eating outdoors under blue sky on a balmy day that makes the food seem twice as tasty but it was the surprise location of this breakfast that made it so special. When we checked in at our hotel we were offered one breakfast in the organic garden. Always keen to try something a bit different we booked up for the day of our dawn balloon flight. After that 5am start we knew we’d be especially hungry. 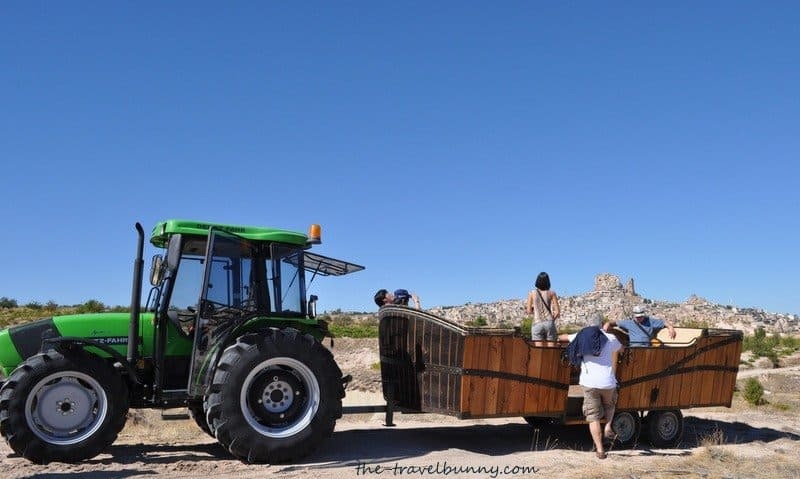 Our unusual mode of transport arrived – a wooden boat affair on wheels pulled by a tractor. We hopped in and trundled up the steep, winding lane where there was sometimes only inches between us and the walls. 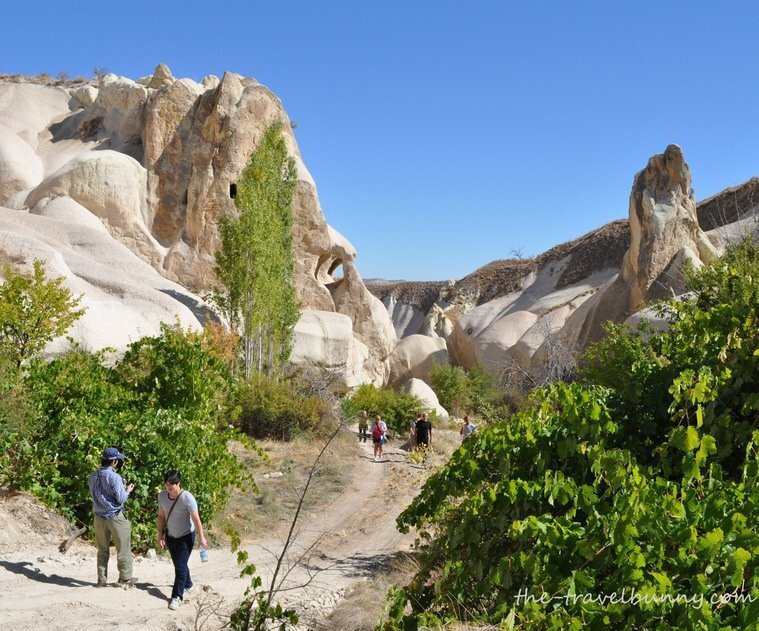 We passed by hostels and homes built into the volcanic rock and hollowed out fairy chimneys. 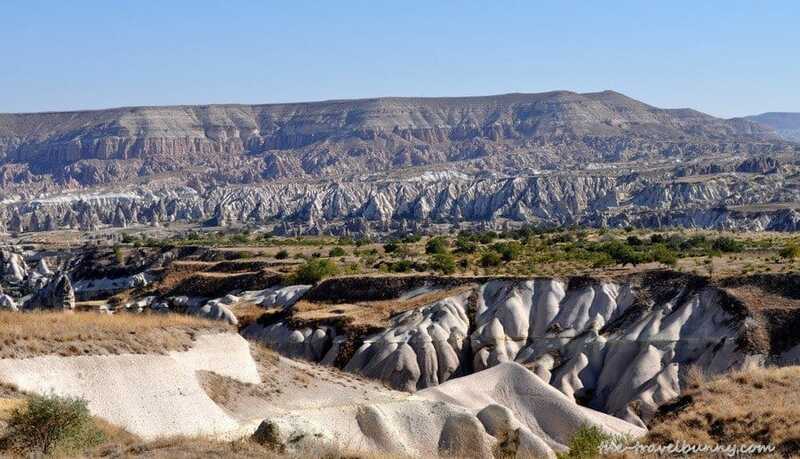 After about ten minutes we reached the top of the village where this is a viewpoint with superb views over Goreme. So where was breakfast? 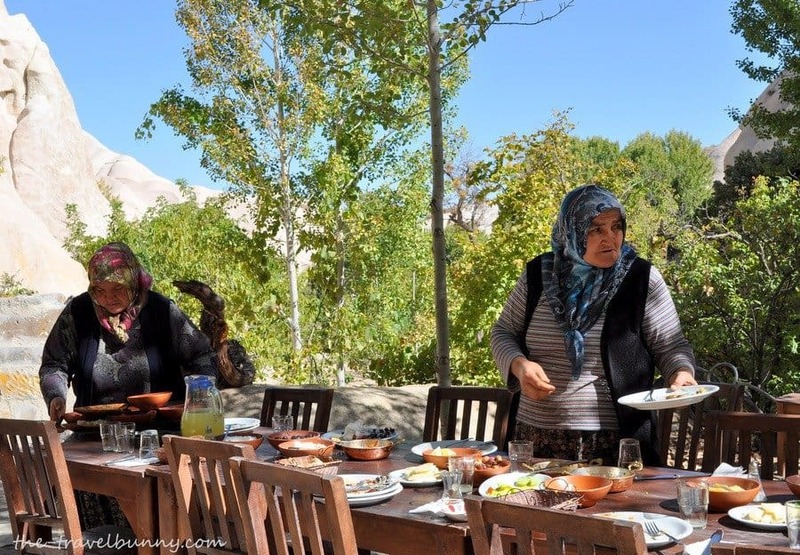 I couldn’t see a vegetable garden or anything edible growing at all but Ali, the tractor driver, led us to the edge of the valley and said ‘welcome to Kral Dresi’. Peering over the edge we saw that steps had been hewn into the rock. Finding breakfast had just become a bit of an adventure! We made our way carefully as it was steep in places and on reaching the valley floor we were delighted to see a cool glade between the natural walls of rock. Under the shade of the trees a sturdy wooden table was laden with an assortment of fresh, home-grown, organic food. 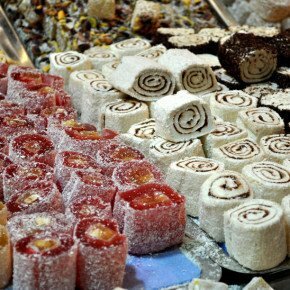 A Turkish breakfast in all its glory. Four types of cheese were set out in rustic platters alongside olives, sun-ripened tomatoes, crisp cucumber and baskets of freshly baked bread warm from the nearby wood oven. 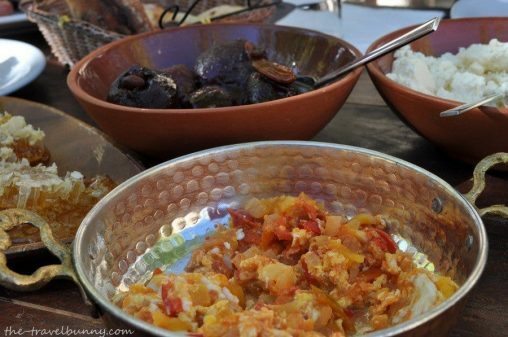 Menemen, a dish similar to omelette, made with onions softened in oil, stewed tomatoes and peppers with eggs scrambled in at the end and cooked on the wood fire until just set was served piping hot and delicious. Home-made fig, apricot and walnut preserves sat side-by-side with creamy yoghurt and honeycomb dripping with golden sweetness. Grapes, melon and apricots rounded off the feast. We relaxed for over an hour beneath the shade of the trees surrounded by the strange volcanic rock shapes and vines hung heavy with dark velvety grapes. The chat was easy and the food divine. 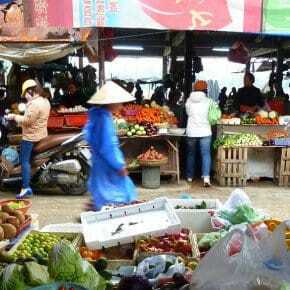 Two women from the village plied us with aromatic, black cay (tea) and topped up the platters until we were full to bursting. When it was time to go we left through the other side of the valley on a 20 minute hike back up to the top. A half-marathon would have done justice to all the food we’d just eaten. 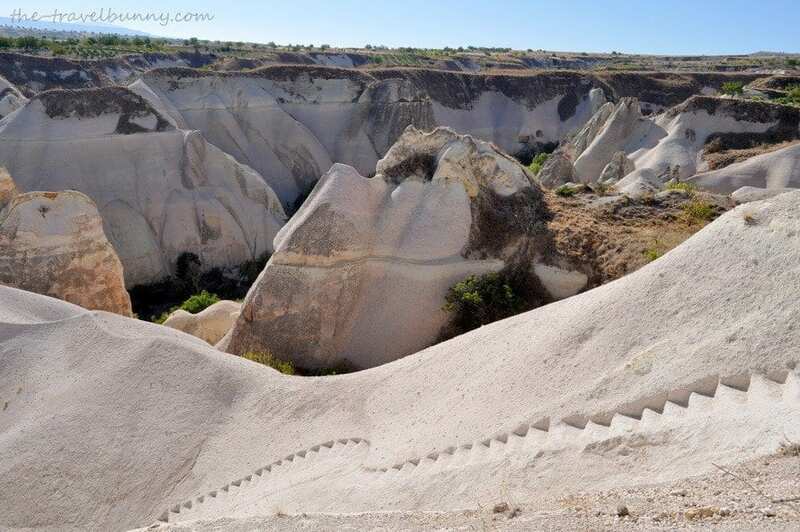 Ali picked walnuts from the trees as we passed and pointed out small holes carved into the rock – pigeon lofts. In the past the droppings would be collected and used for fertiliser on farms and orchards. 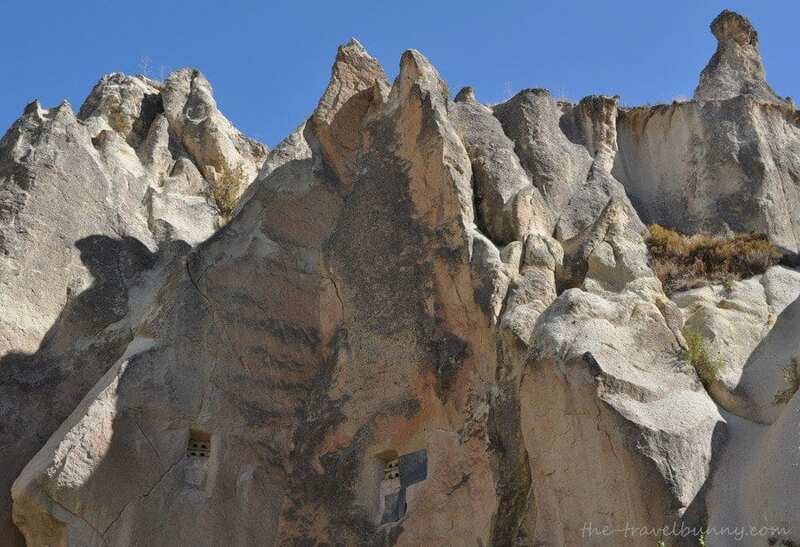 These pigeon houses are found throughout Cappadocia – there is even a valley full of them aptly named ‘Pigeon Valley’. The walk out of the valley was a gentle incline and not as steep as on arrival. We were soon back at the ark for the drive down to the hotel. I took one last glance into the valley where I had possibly just had the best breakfast of my life! We were very fortunate that this was a complimentary trip while the hotel was testing this excursion. Costs are now €15 per person for Kelebek Hotel guests and €25 per person for other guests. (Sept 2012) It includes transfers between the valley and hotels. I was lucky enough to enjoy this wonderful breakfast a few times back in September 2012 when they first introduced it and again when I returned in 2014. Truly an unforgettable experience. Wish I could go back right now! P.S. Ali the “tractor driver” is the owner of the Kelebeck and several other businesses in the area. That breakfast was one of the best I’ve ever had! I’d go back and do it again in a heartbeat 🙂 Ali is such a nice man and an interesting character – we had a drink with him one evening and a long chat. He’s put his heart and soul into his business and it shows. Amazing captures. Love the first one… fantastic atmosphere. Mmm! 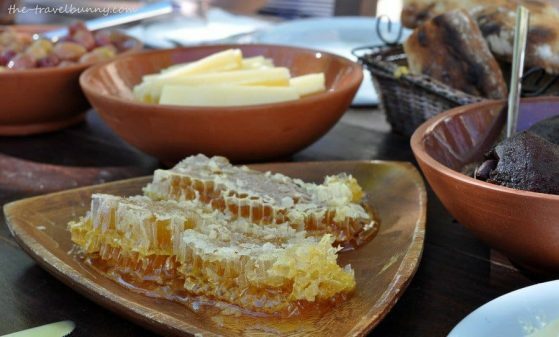 I went to Bosnia this summer and the breakfast was very similar…I loved how all their social functions revolve around sitting at an outdoor cafe and sipping Kava (coffee!) I’ve definitely incorporated this more into my lifestyle since returning to America. I love to eat outdoors but the English weather doesn’t often oblige! It was a bit of an adventure because we didn’t really know what to expect – lovely surprise! 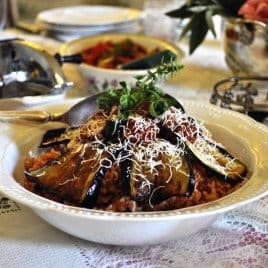 Do you cook/eat any Turkish foods now you”re back in the UK. Anything you can’t live without.?! Can’t wait to experience it, I am going to Istanbul in May – is this visit near Istanbul or somewhere else in the country? 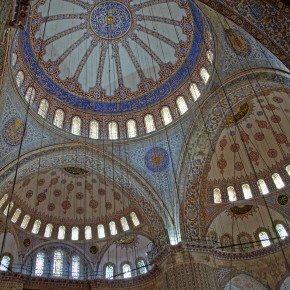 We will likely only be day trips from Istanbul. Nyum, nyum, yum, yum, yum…. Once again I’m green with envy! 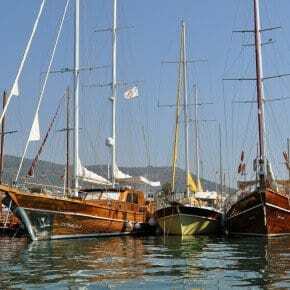 Maybe Turkey should be your next port of call Kathryn…?? I would gladly pay on €15.00 for that breakfast only and be able to eat outside under the trees. Great photos … but not my idea of holiday, but the breakfast .. truly is. This looks so good and amazing! 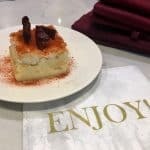 So good I had to write about it!